Before setting foot onto a showroom floor, measure the space where the chair will be located and make sure you have plenty of space to recline the chair fully. Some models are engineered so they can be placed within an inch or so of the wall and still recline, but you’ll need to know how much space you have to work with. Also measure the doorways and hallways that your recliner will have to fit through. Check with the retailer to see if the back comes off of the recliner and can be reassembled in your home. Look for a quality frame. The quality of the piece of furniture starts with a quality frame, and you want one that is strong and supportive. Look for a frame made of a hardwood such as oak, beech, ash, maple or cherry. Ask if the wood was kiln dried; this ensures the frame won’t crack as it adjusts to various climates. Many manufacturers offer lifetime warranty on the frame, and most will offer at least 10 years. 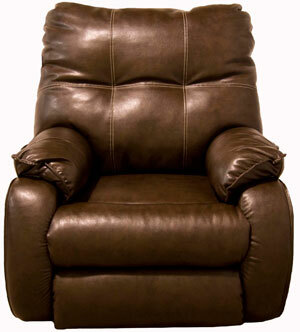 Recliners are offered in a wide range of sizes, from petite to grand. For both your enjoyment and safety, it’s important to find a chair that fits just right, regardless of your height or weight. In addition to being scaled for larger people, big man’s chairs are engineered to withstand extra weight. Petite chairs are scaled so that shorter legs can rest on the floor with ease. Determine what features are important to you and your family. Recliners are offered with an astonishing array of options, including swivels, gliders, rockers, massage, heat, lifters, built-in phones, and even refrigerator units. The reclining mechanism is one of the most important elements, of course, since it is the part that is going to get the most wear. Test it out in the store. Recliners are activated in a variety of ways, with handles, buttons, knobs, simple push-backs, and levers. Is it easy to use and get the chair into the fully reclined position? If not, you might consider some recliners that feature a power mechanism to recline the chair or extend the footrest at the touch of a button. Also ask about the warranty for this mechanism – most reputable manufacturers offer some kind of warranty for this part of the recliner. Recliners come covered in a variety of materials, so consider which one fits your lifestyle best. Leather will offer that richer look and offer years of durability with proper maintenance. However, fabric allows you to be more creative with patterns and colors, and recent advances in textiles have given some furniture fabrics a big boost on the durability scale. Fabrics: Cotton looks nice because it takes dye really well, but it also stains easily. Nylon and rayon both resist stains better than most fabrics. It is a good idea to look for fabrics that are a mixture. Leather: Pure leather is a natural product, conditioned to ward off stains and wonderful for day-to-day use by families. 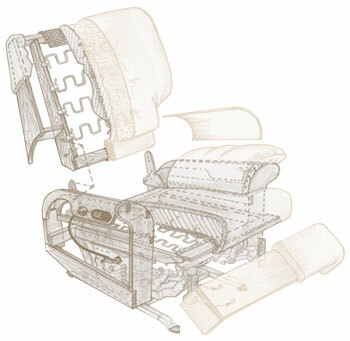 Many leather recliners use a “leather match,” which features leather on the seat, arms, and footrest, and the sides and back will usually be vinyl dyed in a matching color. Building it this way helps to keep the price lower and prevents sagging leather around moving parts. Some manufacturers use a leather match for the entire chair, though, so know what you’re buying. Microfiber: When it comes to bang for your buck, microfiber may be your best bet. With a nice suede feel, it is soft and comfy. Microfiber is made with tiny filaments that are tightly packed together. This creates a fabric that is moisture-resistant, breathable, and easy to maintain. It is more durable than anything other than leather, and generally costs more than traditional fabrics but less than leather.